Surprisingly, the risk of fire and the associated damage tends to be higher in construction sites as compared to other areas. This is actually seen in how tight fire safety regulations tend to be in the case of construction sites. Construction sites are usually littered with a variety of highly combustible materials and temporary electrical works, while also being open to trespassers makes the occurrence of a fire highly likely. Abiding by these fire safety tips in a construction site will give workers some peace of mind, and also safeguard the property under development. It’s recommended that you bring in a fire risk assessor to advise you on how to manage construction site fire safety. This combined with the above tips will definitely help mitigate the risk of fire at the site. Read on to find out some practical fire safety tips to abide by in construction sites. Any construction activity, in a construction site, that results in the production of sparks or flames is referred to as hot works. Where hot works are conducted without regard to any fire safety guidelines, the likelihood of a fire increases. All hot works should cease about half an hour before the site is closed for the day. This should be followed by an inspection of the area where the hot works are being conducted; with the aim of checking for any flames. 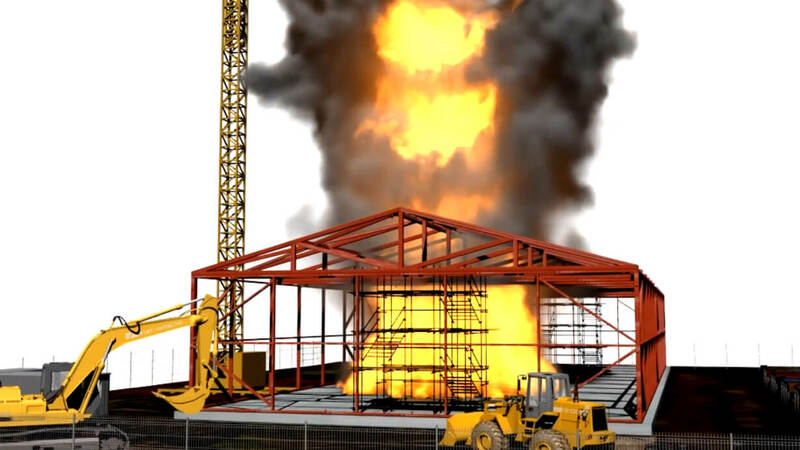 Construction sites are known to have a variety of flammable materials. Highly flammable fluids, wood, wood shavings and packaging bags can all lead to a fire; or make a small fire much bigger. As a rule of thumb, flammable materials should be limited in supply within the construction site. The remaining materials should be stored in a fire resistant cabinet or compartment, away from the site. It is common for temporary electrical works to be put up in construction sites. It is essential that these electrical works be put up, and pulled down when the time comes, by a qualified electrician. This will help ensure that they are up to code at all times. Furthermore, any use of heaters on the construction site should be supervised at all times. Temporary lighting fixtures should be fixed appropriately, and flammable materials kept away. Construction sites produce a lot of waste. This waste should be separated, with the highly flammable variety being stored in a designated area, away from any flames or sparks. It is recommended that the waste be disposed of on a regular basis. Burning of waste on site should never be permitted.